IT REALLY was amazing - there wasn't one Arkwright in the entire telephone directory. I was surveying the contents of my Bradford hotel room, which I had just checked into on the night of the Slade gig. A party of us had travelled up the M1 at the speed of sound in order to scrutinise the band that disappeared from the pop world a couple of years back. A telephone directory for North Yorkshire decorated my bedside table and the dressing table sported a copy of the Bible. Surely the food wasn't going to be that bad. At Bradford University, the crowd were beginning to assemble. We were nabbed in reception, because we weren't wearing hats. It was Bradford student's rag week and , after we had paid a 10p fine we climbed the stairs to where liquid refreshment abounded. Backstage the tension was mounting as far as the roadies were concerned. Nick Van Ede, Slade's supporting act was about to start and after warning us " not to touch the local curry" bounded onto the stage where he received a generous warm welcome from the Leeds crowd. Meanwhile Dave Hill from Slade was laughing and joking in the dressing room and, through mouthfuls of ham rolls and swigs of Newcastle Brown he told me of the time the group played Baileys in Watford. "It really was funny." he grinned "People who go to Baileys aren't usually sure of what they're going to see. Some of them book up weeks in advance just so they can have a meal there and enjoy the evening's music. It just so happened that at our gig there were a load of businessmen on a business outing. It was amazing to see these fat things on legs getting up and into the music and actually mixing with our skinhead following. 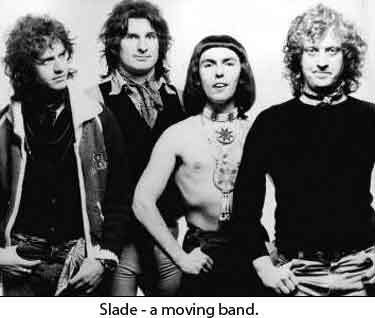 Slade, were to begin with primarily a skinhead band. Now they have established their own identity, but still love to be among the crowd. 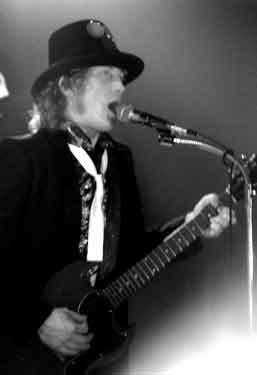 By this time Nick Van Ede had completed his stint and the crowd were shouting "We want Slade..."
Eventually the lights dimmed and the crowd went wild. The group emerged from the dressing rooms and flash bulbs flicked as the punters hoped to catch a pre gig glimpse of their heroes. "Noddy's wearing his hat" screamed a guy near to me and when the lights went up the cheer was tremendous. This was the crowd's band and they were all there to have a ball. "Good evening Bradford." Mr Holder shouted in his own inimitable way. The kids returned his sentiments. "Bradford is going to rock tonight," he promised. "We'll be rockin' 'n' rollin' in the old town tonight....."
With that, Dave Hill pounced onto his guitar's amp, burst into a solo and Don Powell beat out the rhythm on his drums. The sound was incredible and the lighting was superb. Half way through the set Noddy Holder told the circle to "Get up and feel good." The people upstairs remained calm and collected, they weren't going to make fools of themselves.....but how wrong they were. The spotlights changed direction and instead of beaming their spectacular bedazzling light on the group, altered range onto the circle. Everyone was up in seconds - and remained so for the rest of the evening. The people were ecstatic as Slade finished their fourth encore and through a haze of smoke, coloured lights and a jovial crowd, they made their way back to the dressing rooms.. They were to achieve a Slade's fan dream; to have dinner with the four manned band. The university's PA system went into full swing, and while 'Singing In The Rain' graced the loudspeakers and fans laughingly waltzed to an era of music ages from their own. Slade joined us in a hectic race to the nearest available restaurant. Nick Van Ede joined us. Noddy Holder immediately verified his image. Ordering "curry and chips" he talked to me about his favourite pastimes. " I adore films," he shouted as he poured himself another glass of the old grape juice. "My favourite film of all time has got to be 'Cabaret' - whenever you've got the time, see it." He grinned, saucily "And if you take a girl it's even better." Jimmy Lea talked about the band's past wealthyness. "It was very embarrassing when I had my Rolls Royce. I love fish and chips and I had to park my car down the road and run up to the shop. Imagine if I had driven up to the shop and got out for a ninepenny portion!" Don Powell talked of when the band visited a Polish POW camp, and when he was had up for drink driving. " I got pulled up and was refused permission to drive home, so I had to walk." He confessed over his measly offering of grapefruit juice. "The police drove off and as they passed me trying to find my way home, they blew rasberries at me out the window. It didn't stop them however asking for my autograph...."
The band are an incredibly down to earth and professional group of lads, who have now realised that fame and fortune isn't everything. "We've had our taste of stardom," Dave Hill told me, "but we didn't like what we saw of it. Thank God those days are past." And so in the early hours of the morning, the band decided to make a move towards their Wolverhampton homes. And they've been moving ever since - remember Nick Van Ede's immortal words: "Don't touch the local curry.....?"